For many incoming students, these are some of the feelings that come up when they think about those first few weeks of college. That’s why Wisconsin Basecamp, a wilderness orientation for new University of Wisconsin-Madison freshman and transfer students, exists. Students choose a backpacking, canoeing, or rock climbing trip. No matter what they choose, they’re going to learn about college life and outdoor skills and have the opportunity to create life-long friendships. Trip student leaders also address new students’ questions about life on campus throughout the trip. Some of the main questions Basecamp leaders receive are related to residence hall life, eating on campus, healthy living, getting involved in organizations, and fears of going to college. Basecamp is a chance to ask current UW-Madison students questions without fear or judgement. 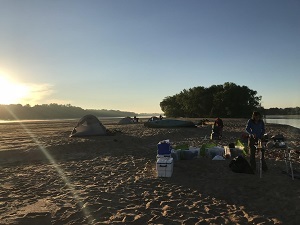 Basecamp leaders set up camp on a Wisconsin River sandbank. Without question, when these students begin classes in the fall, they will be confronted with plenty of new and unfamiliar situations. But, those who participate in Basecamp have already recently tackled new situations on their trips. Basecamp helps students feel prepared to take on new challenges during the trip and, especially, in the fall. Often, one of these nerve-racking moments in college is trying to make new friends. This is where Basecamp also really makes an impact. The bonds that participants make with each other and with the outdoors are so impactful that many of them even go on to lead trips themselves. For those who are on the fence about Basecamp, both Bucci and Killalea say to challenge yourself, and take the chance. With the next few years filled with new people, challenges and experiences, why not start the journey now? For more information, visit union.wisc.edu/basecamp. Registration open now.